We specialize in providing camel ride operations for zoos and parks. Our camels are very well trained, gentle, and safe. We understand the importance of guest relations, and both our staff and equipment are top notch. Camel rides are an original attraction that will be a guaranteed highlight of your customers visit, and keep them coming back for more! Our camel ride concession also includes the sale of digital photos and camel hair jewelry. We typically operate on a gross revenue pecentage commission with the venue. Find out how we can set your organization apart from all the others while being financially rewarding at the same time! Our camels add an unforgettable and awe inspiring touch to live nativities, passion plays, and other live productions. They are specially trained to appear onstage and in indoor productions. Outdoor shows are no problem either as our camels are northern raised and accustomed to weather extremes. We can also provide trained donkeys, sheep, goats, and other animals for your production. Let us know what your needs are, we can custom produce for any show, large or small. 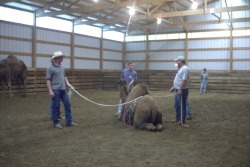 We have many years of experience training camels and are proud to now offer our services to private owners. We have trained camels for zoos, commercial ride operators, movie appearances, and circuses around the U.S. Do you have a camel with behavior issues? Problems loading in a trailer? Do you want your camel trained to ride, drive, cush, or perform behaviors at liberty? Give us a call. We are proud of our training accomplishments and techniques and use only positive and humane methods. We can work with your animals at your facility or at ours. We also provide camel transportation throughout the U.S. with our first class equipment. Contact us about our reasonable rates.